Ahsan Kareem, the Robert Moran Professor of Civil Engineering and Geological Sciences at the University of Notre Dame, has been appointed by the National Research Council, Division of Earth and Life Sciences, of the National Academy of Sciences to serve on the Committee on the Evaluation of a Site-Specific Risk Assessment for the Department of Homeland Security’s (DHS) Planned National Bio-and Agro-Defense Facility (NBAF). The committee of 17 experts will review the initial risk assessment and the developing work plan for the facility as part of the Department of Defense and Full-year Continuing Appropriations Act of 2011. Committee members are charged with identifying gaps in risk assessment and providing credible solutions, as well as options, for the facility. Their final report will be submitted to the DHS and Congress before any funding will be provided for construction of the NBAF. The facility is slated to feature a biocontainment area for the research and diagnoses of foreign animal and zoonotic diseases. In addition, the facility will play a critical role in safeguarding the nation’s food system. However, its anticipated location in Manhattan, Kan., an area known for frequent tornadoes, requires that special attention be paid to the performance and safety of the laboratory structure. Kareem’s expertise in wind engineering and mitigation strategies is particularly suited for this risk assessment study. Kareem currently serves as the director of Notre Dame’s NatHaz Modeling Laboratory, where he specializes in probabilistic structural dynamics, fluid-structure interactions, structural safety, and the mitigation of natural hazards. He uses computer models and laboratory and full-scale experiments to study the dynamic effects of environmental loads under winds, waves and earthquakes on structures and to develop mitigation strategies to enhance the performance and safety of structures, as well as to better understand and predict the impact of natural hazards on the constructed environment. He has been a Notre Dame faculty member since 1990. In addition to this most recent honor, Kareem has made a major impact in advancing the state-of-the-art in wind effects on structures through the characterization and formulation of wind load effects. He spearheaded the redevelopment of ASCE standards for wind-sensitive structures — specifically ASCE 7, which outlines the minimum design loads for the safety of buildings and other structures, such as towers — and advancement of the code’s global implementation as a benchmark standard. His work has also led to the development of e-technologies for web-enabled analysis and design of structures and the establishment of a cyber-based collaboratory for research and education in wind effects. Beyond his research, Kareem has distinguished himself as a leader within the structural engineering community through his service as first president of the American Association for Wind Engineering, service as editor-in-chief of the International Journal of Wind and Structures, associate editor of the Journal of Structural Engineering and Journal of Engineering Mechanics and service on many advisory panels of the National Research Council, National Science Foundation and industry. Among other honors are his selection as an honorary professor at Tongji University, Shanghai, China; an ASCE distinguished member and the inaugural recipient of the Alan G. Davenport Medal, presented by the International Association for Wind Engineering in recognition of his distinguished achievement in the dynamic wind effects on structures; his election as a member of the U.S. National Academy of Engineering and a foreign fellow of the Indian National Academy of Engineering and his receipt of the ASCE’s State-of-the-Art award for scholarly contributions to full-scale monitoring of tall buildings. 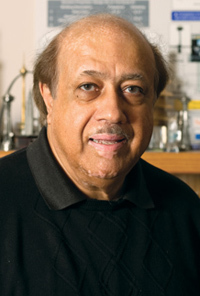 Kareem has also received the Robert H. Scanlan Medal for outstanding original contributions to the study of wind-load effects on structural design and the Jack E. Cermak Medal in recognition of his contributions to the study of wind effects on structures. His receipt of the Davenport, Scanlan and Cermak medals is unmatched recognition in his field. With a focus on structural and fluid dynamics, Kareem received his doctorate in civil engineering from Colorado State University. He earned his master’s degree in structural engineering from the University of Hawaii through a joint program with the Massachusetts Institute of Technology, and he received his bachelor‘s degree (with distinction) from the West Pakistan University of Engineering and Technology. Originally published by Nina Welding at newsinfo.nd.edu on January 18, 2012.